WE WISH YOU ALL a Happy Spring & Summer. Pack your stuff, let us handle your visa for your travel. WE GUARANTEE VISA OR FULL 100% REFUND. No Risk or Hassle. Note:* Public Holidays & Weekends - the Immigration Office will be closed for normal Processing. Last minutes Emergency Visa on Arrival is still available. Due to high season, remember to apply early and choose correct processing time! Apply early and in time. Christmas and New Years, Tet (Lunar New Year in 2nd-11th Febr), Death Anniversary of Hung Kings 13th-15th April, Reunification Day and International Labour Day 30th April - 01st May, Celebration of The People's Public Security of Vietnam 18th Aug - 20th Aug, National Day 1st Sep - 3th Sep ...etc. Only emergency visa is possible to process during these periods. Latest application booking until 9h00 AM the day before Holidays!! Consider also, there will be much queue once open again for normal processing after Holidays. * USA: Good News for Visa to Vietnam for US citizens! From 15th December 2016, US passport holders are allowed to apply all visa type again:) Earlier, since 28th Aug. 2016, all US passport holders was only allowed to apply for 1 years multi visa into Vietnam. China, HK, Taiwan, Macau: - Change in regulation from 12th Nov. 2018 as semi-restrict. Check our order form for updates. * Visa code: Pre-arranged Vietnamese visa at the embassy (visa code) is now available on our website. Similar process as visa on arrival but get the visa at a pre-chosen embassy instead. Visa stamp paid at the local embassy with local rate. 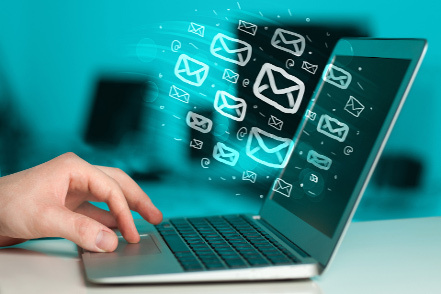 Advice to add 2 additional days for the embassy to check their internal emails/ fax/ letters! * Business visa has two options; A. Meeting, research etc. 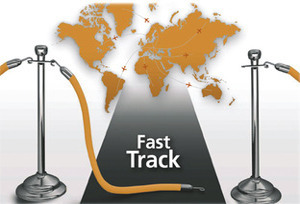 Book with our VIP Fast Track and combine your trip with tourism, B. To work/ study and get paid in Vietnam! Use correct visa length type Business. (We will guide and do all the work for you). The visa approval letter will be issued by the Immigration department of Vietnam within 5 working days. Please make sure your travel date are after the processing time. Orders made before 08:00 will receive the approval letter at 13:00. Orders made before 12:00 will receive the approvel letter at 17:00. Orders made after 12:00 will first be processed the next working day. For extreme urgent cases (1-2 hours processing), please order "extreme urgent" and contact us immediately at support@starvietnamvisa.com for further guidance (include Pick up service inside the airport). You can enter and exit Vietnam only one time within 6 months. Star Vietnam Visa will guide and help you through the whole visa process. We have staff inside the international airports of Vietnam in Hanoi, Da Nang and Ho Chi Minh City to support emergency cases. Get supported by our professional team. Star VIetnam Visa are experts in this field so leave the paperwork to us and we guarantee a pleasant and trouble-free journey to Vietnam. We can gurantee you that we are cheaper and faster than at any embassies since we process directly towards the immigration department of Vietnam. 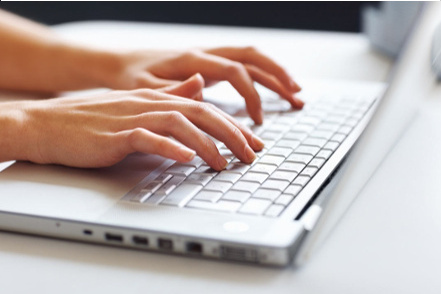 As a leading agency we offer low price and high professional quality on our services. The customer is our number 1 priority. 100% Visa Guarantee or a full refund. A valid visa is required to enter Vietnam for most visitors. Certain countries have visa exemption agreements with Vietnam where you can enter Vietnam without a visa for varying time periods. Here you can check Vietnamese visa requirements for your country. All Vietnamese embassies and consulates around the world. Use our application form to order pick up of visa at the embassy of your choice. Thank you very much. I really appreciate the professional and expedient service that you provided. Thank you very much for your caring attitude and suggestions. I am confident to assume you are very knowledgeable and trust-worthy. Yes, it is. It is the same as a regular visa valid and legal, but not issued by the embassy. Visa on arrival is officially issued by the Immigration Department of Vietnam (Vietnamese Government) through an agency, and therefore it has the same validity as the visa you get from any Vietnamese embassy abroad. "Visa on arrival" is stated in the Immigration Laws of Vietnam Article 24, 1999, clause #6, Chapter II. Vietnamese Visa Code or Vietnamese visa approval code is a document granted by the Immigration Department of Vietnam and used for picking up the visa to Vietnam at your chosen Vietnamese embassy. We will help you to apply for a visa code through the Vietnamese Immigration Office. They will fax your visa approval code to the embassy or consulate of your choice where you just bring your passport to receive the entry visa to Vietnam. Use our application form to order pick up of visa at embassy. Note: Visa stamping fee is regulated by each local embassy and with local currency. Vietnamese Visa on arrival or evisa is the same type of visa that you can pick up at the Visa on arrival counter when landing in one of the international airports in Vietnam. This is the quickest and cheapest way to get your Vietnamese entry visa for normal passport holder with purpose of tourist or business. You just need to fill in our online application form, pay the service fee, get your visa approval letter within the chosen processing time and pick up your visa at on of Vietnam's international airports. 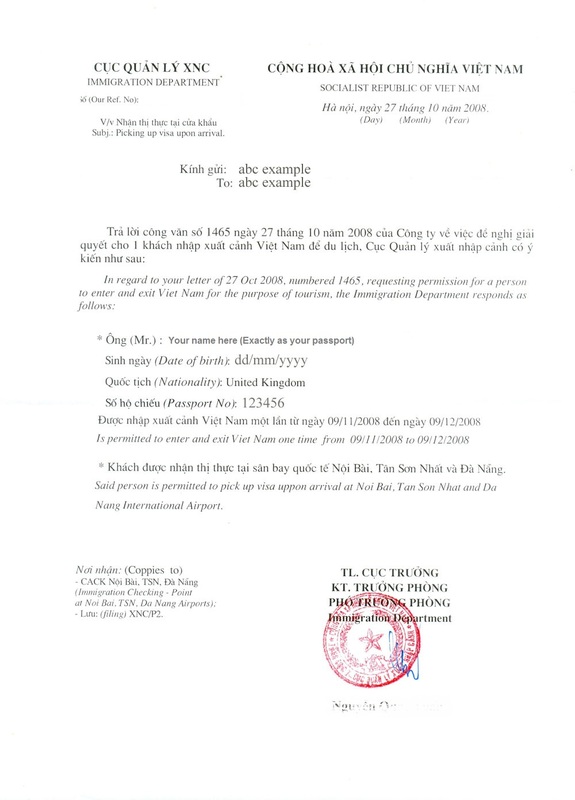 The Vietnamese visa approval letter is a pre-approval Visa letter issued by the Immigration Department of Vietnam (Vietnam Ministry of Public Security), which supports foreigners to get visa to Vietnam upon arrival at of the international airports of Vietnam or visa code at a pre-chosen embassy. Only travelers landing in one of the Vietnamese international airports (Eg. Ha Noi, Da Nang, Nha Trang or Ho Chi Minh City) can apply for this Visa on arrival. If needed by land, then visa code or e-visa* if eligible nationality. No, the approval letter is only applicable for those traveling by air through one of the Vietnamese International Airports (Eg. Ha Noi, Da Nang, Nha Trang or Ho Chi Minh City). If traveling by land, you need to contact your nearest embassy or consulate to submit your Vietnamese visa application or order a visa code through our application form and choose the visa type "visa code". Visa code is the similar to visa on arrival, you get pre-approved, pay visa stamp (local rate/ fee) at pre-chosen embassy and get the visa stamp. Check our order confirmation email after completed your order for more details. There are several ways to submit your application for a visa to Vietnam. Traditionally you submit your passport and application through a travel agency or send or deliver directly to your nearest Vietnamese embassy or consulate. To apply through the embassy please visit your nearest embassy for more information. You can also apply for a visa to Vietnam online and choose a visa on arrival or a visa code. If eligible, you can apply for e-visa*. We know there might be some uncertainty about Vietnam visa on Arrival, but we can assure you that we can obtain your pre-arranged visa to Vietnam. 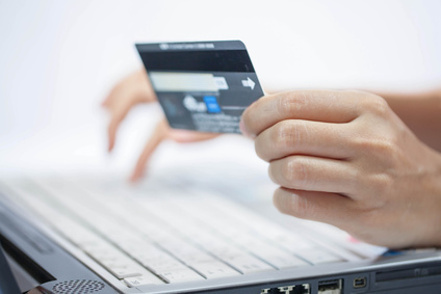 In the unlikely event your visa is not approved we offer a 100% money back Guarantee. No questions asked. We have so far 100% successful rate. No customers has been rejected to enter Vietnam or getting a visa through us as long as you are not in the black-list. We are therefore glad to be one of the preferable sites giving you Vietnam Visa on Arrival service. Your satisfaction is our guarantee. We are simply one of the best agencies providing pre-arranged visa on arrival to Vietnam online. Do not hesitate to contact us. Our team will make sure you get your visa safe and on time. Visa on Arrival is the fastest and cheapest way to apply entry Visa into Vietnam. 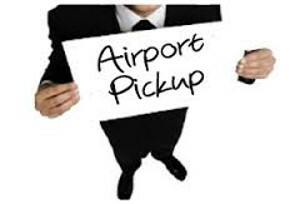 Visa on Arrival is fast, simple and reliable. The process is strongly recommended by the government to make your entry as simple as possible. Different travel agencies, travel publications, airlines and other governments also recommend this type of entry visa into Vietnam.